ADLINK Technology, a leading global provider of trusted testing and measurement products, has announced a new PXI Express chassis for applications requiring enhanced bandwidth and higher density and capacity. ADLINK's PXES-2780, an 18-slot PXI Express chassis with ten hybrid peripheral slots provides a configurable PCIe switch fabric, enabling configuration with two-link x8, and four-link x4 PXI express deployments, allowing full utilization of the PCIe gen2 bandwidth. Featuring fast data throughput, flexible configuration, innovative structure, and intelligent management functions, the PXES-2780 ideally meets the needs of a wide variety of testing and measurement applications, such as wireless and RF testing. The ADLINK's PXES-2780 18-slot PXI Express chassis provides one system slot, one system timing slot, ten hybrid peripheral slots, and six PXI Express peripheral slots, for up to 8 GB/s system bandwidth and 4 GB/s slot bandwidth for dedicated peripheral slots. Support for 2-links x8 deployment by a configurable PCIe switch fabric eases higher bandwidth system upgrades. The ten hybrid slots preserve backward compatibility to accept PXIe/PXI/cPCIe/cPCI modules, providing maximum flexibility in PXI and PXI Express module slot replacement, reducing the costs of system upgrade. The PXES-2780's innovative structural design delivers high availability in reliable testing systems, and built-in high quality reference instrumentation clocks for module synchronization ensure performance of modules from 3rd party vendors. Our innovative cooling system, dissipating 38.2W for each peripheral slot, and a high quality independent power module for all rails, together maximize operational reliability. For noise-sensitive environments, the PXES-2780 presents a low operating noise level of 46.3 dBA at room temperature. The PXES-2780 offers built-in intelligent chassis management, enabling communication with embedded controller via SMBus, or remote management from a remote system via a standard RS-232 port. With ADLINK's software-configurable "PXES-2780 Intelligent Management Interface, users can easily monitor and manage test equipment, whether bench-top system or connected external test instruments, including settings for the PCIe switch fabric, fan speed, chassis status monitoring and reporting, remote chassis power on/off, and notification when user-configured limits are met. "The ADLINK PXES-2780 PXI Express chassis' enhanced bandwidth, higher density, & capacity are typically designed for multi-channel testing applications. 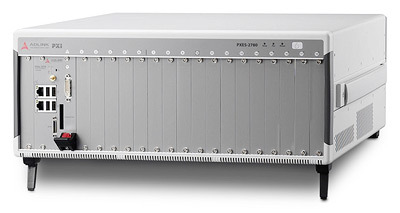 As an example, for customers who require a dual channel signal analyzer for RF/Microwave signals, ADLINK's 18 slot PXES-2780 chassis can accommodate large numbers of modules to test dual DUT at the same time, saving space and increasing testing system efficiency." noted Catherine Wu, Product Director of ADLINK's Measurement and Automation Product Segment.